The graph shows changes in fish catches for the US and Canada over the last 30 years. The most significant feature is that fish catches have declined drastically in both the US and Canada since the mid-1980s. Although Canadian production is much lower, its echoes US figures, declining or increasing at the same rate. Between 1972 and 1977, US fish catches averaged between 2.5 and 2.75 million tonnes per year, while Canadian landings fluctuated between 800,000 and 1.1 million tonnes. In 1997, however, there was a big increase in fish caught in the US, and this rise continued up to a peak of 5.5 million tonnes in 1987. During the same period, Canada’s catch increased from 1 million tonnes to 1.5 million tonnes, an increase of 50%. From 1987 onwards, there was a sudden decline in both countries. US figures tumbled to 4 million tonnes in 1995, a drop of 28%, and Canadian catches plunged to 0.5 million tonnes, a drop of 66%. In the following four years, US catches fluctuated around the 4 million tonne mark, while Canadian catches rose very slightly. 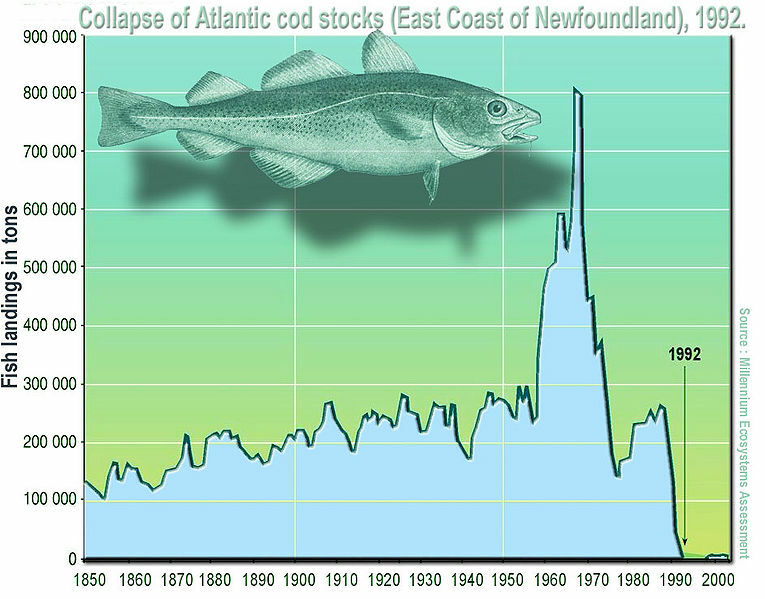 In general, both Canadian and the much larger US catch have declined dramatically since their peak in the mid-1980s. Some fish that you buy in the store can be 50 years old! Fish and chips (usually cod) used to be served wrapped in old newspaper in the UK. 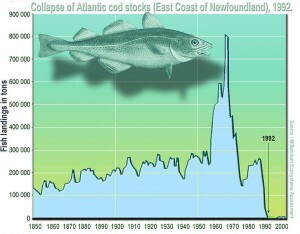 Have a look at this graph which shows the decline in cod catches in Newfoundland. Click for larger image. This mildly hypnotic Canadian video describes cod and other marine life in Newfoundland.